I can take care of all your printing and framing requirements. I work with three fantastic companies to provide a full printing service for my Illustrated Portraits and Wedding Stationery. All my printing is done here in the UK. I generally recommend two different paper stocks for all of my printed Wedding Stationery and Artwork. However, if you have something else in mind, or a specific look you'd like to achieve, please let me know and I will source the appropriate paper for your project. For all my Illustrated Portraits, my paper of choice is 'Somerset Enhanced Velvet' (255gsm) which is made from 100% cotton. It is an archival grade, slightly textured paper which is gorgeously velvety to the touch. Illustrations are Giclée printed using Fine Art Trade Guild approved equipment and inks. The ink colours will last seventy years or more! I recommend that most of my Custom Stationery be printed on Tintoretto Gesso 300gsm. It is a high quality, matt paper with a felt-marked surface in an off-white shade. It lends itself well to Wedding Stationery and the subtle texture does not detract from any wording or small illustrated details. In addition to printing your illustration, I can also arrange for your giclée printed artwork to be window-mounted and framed. You can choose a 20mm frame moulding with a 50mm mount or a 35mm frame moulding (recommended for large portraits) with a 50mm mount. All window mounts are hand-cut and are soft-white in colour. You will be able to choose from a range of mouldings in different colours and finishes. Frames are handmade to order so, like your drawing, you can rest assured that the frame will also be 100% bespoke. Please note, my framers use styrene instead of glass as it is far safer to deliver and there is less risk of it cracking in transit (pictured in the photo below). (All portraits and stationery is available in standard A-sizes and custom sizes upon request). I have teamed up with the wonderful House of Henry so I can arrange for your bespoke portrait to be printed onto fabric! 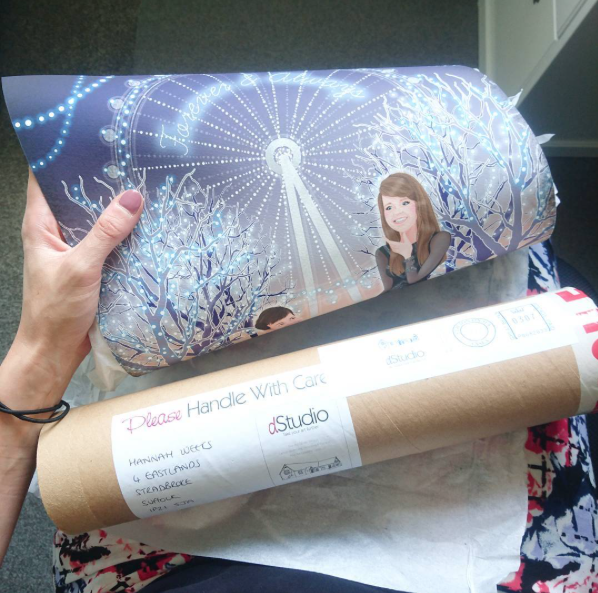 You will be able to choose from six different fabric colours, and once chosen, the printed fabric will be mounted inside two 8mm-thick acrylic sheets and held together by tiny but strong magnets in the corners. The frame stands up independently, no hanging fixings required. This really is a unique printing option, and makes a fantastic gift. (Available in two sizes – 5"x7" and 5"x5"). You will receive a £5.00 voucher to spend on anything from House of Henry when you buy a Framed Fabric Print. I will include the cost of your printing and framing in your quote once I know what your printing and/or framing requirements are when you make an enquiry. Please get in touch to discuss your project or fill in my get a quote form.